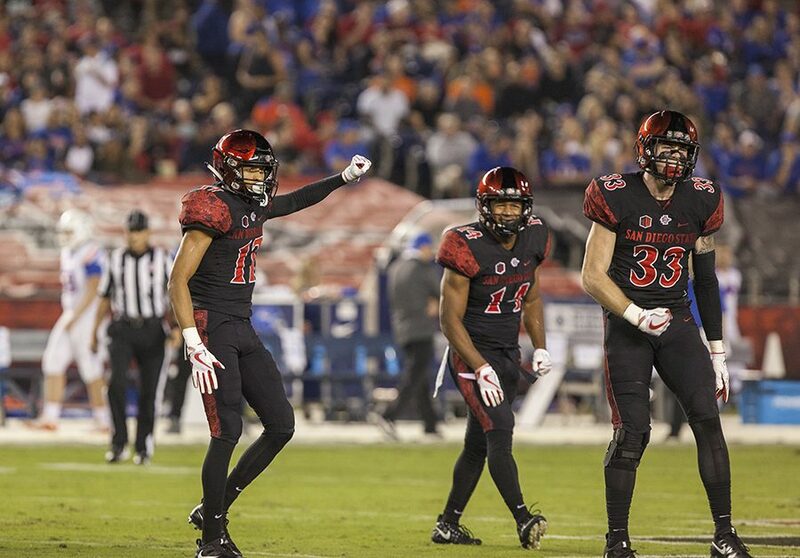 Ron Smith (17), Tariq Thompson (14), and Parker Baldwin (73) celebrate a defensive stop in their game against Boise State on Oct. 14 at SDCCU Stadium. 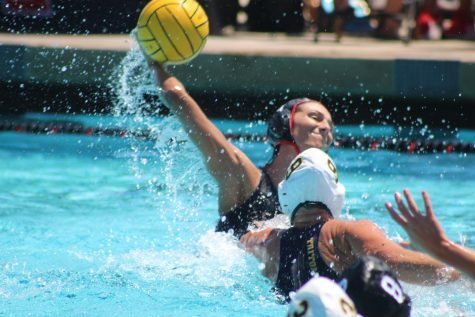 The Aztecs lost the game 31-14. San Diego State football sophomore safety Tariq Thompson is well-decorated for a player heading into only his second collegiate season. Last year, Thompson became the first SDSU true freshman to start since 2009, and was named a Freshman All-American by both the Football Writers Association of America and USA Today. 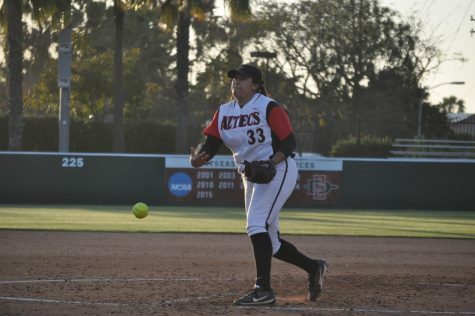 This season, the local product from St. Augustine High has been named to the 2018 Mountain West Preseason All-Conference Team. Thompson said that while receiving the award is an honor, his only focus is on improving and helping his team win games. 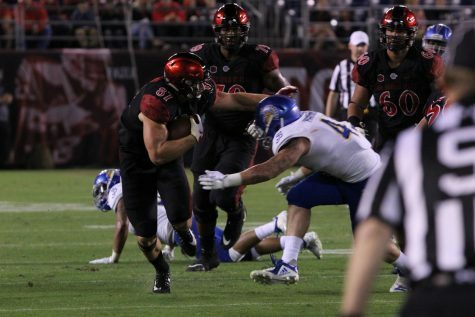 Thompson did his fair share last season, racking up 63 tackles to go along with a team-high five interceptions, including one he ran back 83 yards for a touchdown in the Aztecs week five victory over Northern Illinois. Despite this, Thompson said he feels he wasn’t in the best shape last season, and that this year he will be able to contribute even more. 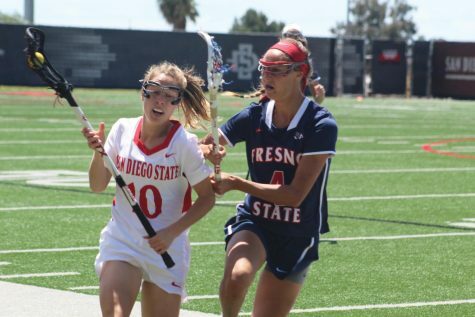 SDSU finished the 2017 season with a record of 10-3, but failed to make the conference title game after regular season losses to both Fresno State University and Boise State University. 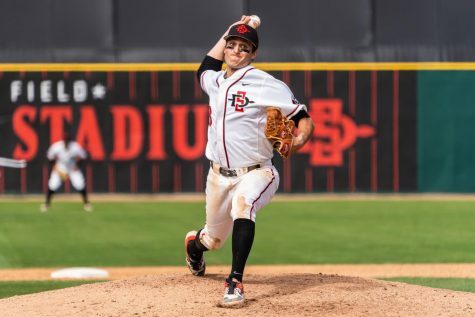 The Aztecs have been voted to finish second in the West division this year, behind Fresno, the first time the Scarlet and Black have not been the division favorite since 2015. 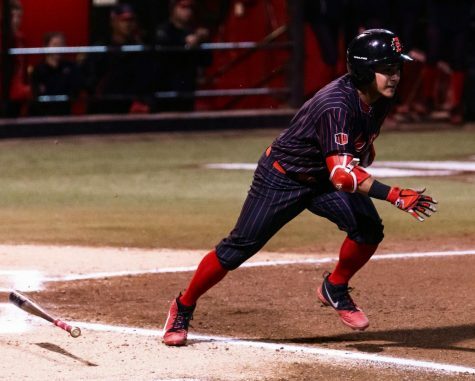 Thompson said being voted second is a reminder of how the the team came up short, but that this year, like every year, the goal is to win a conference championship. Thompson will be starting in one of the two Warrior spots, which will have him running around in the defensive backfield in head coach Rocky Long’s 3-3-5 defense. While Thompson is still a young player, his advanced skill set has placed him in the position of being a leader on a team which will be looking for him to set the tone among the defensive backs. First-year defensive coordinator Zach Arnett said that the best way for Thompson to lead is to perform out on the field. 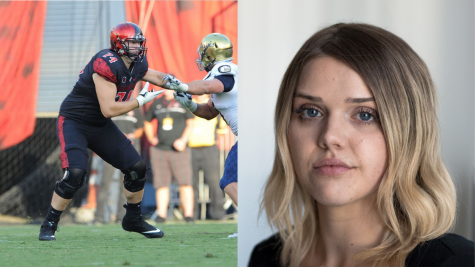 Another player with a leadership role on the defense is senior linebacker Ronley Lakalaka, the Aztecs reigning tackle leader with 82. Lakalaka heaped praise on Thompson, and said he expects him to thrive in his new role. 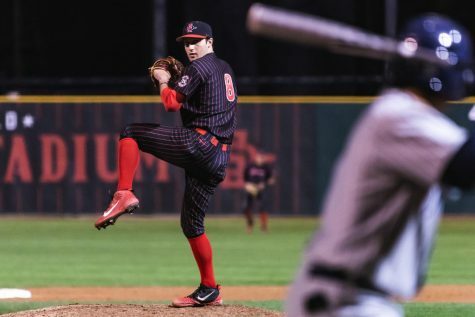 Thompson said he still has to work on getting used to his role as a leader, but he accepts the challenge and is relying on help from upperclassmen, such as Lakalaka, for support.